In 1997, two researchers from the University of Bristol published a paper attempting to solve a seemingly simple problem — how can clinicians evaluate a patients poo. Categorizing poo was important. It is an indicator of “intestinal transit rate,” which means how long it takes food you put in your mouth to come out the other end as poo. Everyone has a pretty good idea of what this means. When you have diarrhea, this happens quickly. When you are constipated, this takes a long time. But how do you objectively qualify this? If you have any kind of bowel irritation or GI illness, your doctor will usually start by asking you questions about what you are eating, and then will ask about your bowel movements. 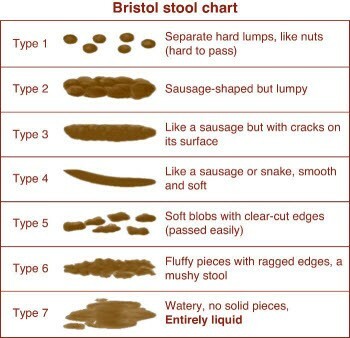 And since the Bristol Stool Scale (BSS) was published nearly 20 years ago, this has become the gold standard for clinical evaluation of your poo. Recently, the “gut microbiome” has been a hot topic for lots of people. The New York Times has written about it, lots. Researchers think it is an important area of focus for understanding lots of disease and health issues. An important paper from earlier this year in Science looked at the gut microbiome on a population level to try and better understand it. And one important finding from that research? The BSS is the best way to determine if you have a “healthy” gut microbiome. One of the great things about the BSS is it’s simplicity. There are 7 types of poop. Each one has a number. And a picture. 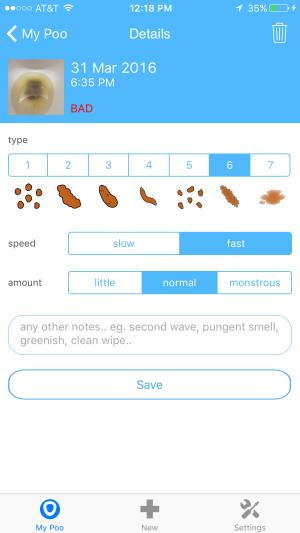 Pick the poop drawing that looks the most like your own, and you have classified your poo. If you have Irritable Bowel Syndrome, or Crohn’s Disease, or simple constipation, your doctor will probably ask you to do this. An example of a very bad poo! But tracking poo can be helpful for everyone, even if you aren’t sick or medicated. If your diet, or exercise regimen, or lifestyle choices have you waking up to the occasional Type 7, or if your recent hard cheese obsession has you dropping more Type 1’s than you’d like, tracking your poo can help you understand this and fix it. One way to do this is to just take a peek down each time you deuce and take a look at what you’re working with. Many people already do this. But how to keep track of how your last few days of dookie rate on the ‘ole Bristol? Maybe you should keep track! Today, there are lots of ways to do this using smartphone apps. I use one called Pookeeper. It’s a simple diary. Every time you poo, open the app and pick your type. If you are gross or awesome, take a picture of your poo as well. do this every time you poo, and eventually you will start to learn something! This is especially helpful if you feel like something is wrong. Pooing too much? Not enough? Is it possible you had diarrhea twice this week? If you are keeping track, you can better understand what it means, and maybe do something about it. Many times this can be something simple, like, maybe don’t drink three lattes every Monday, if you are always going to drop a double Type-7 every Tuesday.